Taking the time to be properly trained in how to use standard learning technologies will in the long run save you a good deal of time and will enable you to achieve a much wider range of educational goals than you would otherwise have imagined. learner-generated tools, such as e-portfolios. It is not necessary to use all or any of these tools, but if you do decide to use them, you need to know not only how to operate such such technologies well, but also their pedagogical strengths and weaknesses (see Chapter 6, Chapter 7 and Chapter 8). Although the technologies listed above will change over time, the general principles discussed in this section will continue to apply to other new technologies as they become available. If your institution already has a learning management system such as Blackboard, Moodle, Canvas or Desire2Learn, use it. Don’t get drawn into arguments about whether or not it is the best tool. Frankly, in functional terms, there are few important differences between the main LMSs. You may prefer the interface of one rather than another, but this will be more than overwhelmed by the amount of effort trying to use a system not supported by your institution. LMSs are not perfect but they have evolved over the last 20 years and in general are relatively easy to use, both by you and more importantly by the students. They provide a useful framework for organizing your online teaching, and if the LMS is properly supported you can get help when needed. There is enough flexibility in a learning management system to allow you to teach in a variety of different ways. In particular, take the time to be properly trained in how to use the LMS. A couple of hours of training can save you many hours in trying to get it to work the way you want. A more important question to consider is whether you need to use an LMS at all – but that question should only be considered if the institution is willing to support alternatives, such as WordPress or Google Docs, otherwise you will end up spending too much time dealing with pure technology issues. The same applies to synchronous web technologies such as Blackboard Collaborate, Adobe Connect or Big Blue Button. I have my preferences but they all do more or less the same thing. The differences in technology are nothing compared with the different ways in which you can use these tools. These are pedagogical or teaching decisions. Focus on these rather than finding the perfect technology. Indeed, think carefully about when it would be best to use synchronous rather than asynchronous online tools. Synchronous tools are useful when you want to get a group of students together at one time, but such synchronous tools tend to be instructor-dominated (delivering lectures and controlling the discussion). However, you could encourage students working in small teams on a project to use Collaborate or another synchronous tool to decide roles or to finalize the project assignment, for instance. On the other hand, asynchronous tools such as an LMS provide learners with more flexibility than synchronous tools, and enable them to work more independently (an important skill for students to develop). These technologies are deceptively easy to use, in the sense of getting started. They have been designed so that anyone without a computer science background can use them. However, over time they tend to become more sophisticated with a wide range of different functions. You won’t need to use all the functions, but it will help if you are aware that they exist, and what they can and can’t do. If you do want to use a particular feature, it is best to get training so that you can use it quickly and effectively. New technologies keep arriving all the time. It is too difficult for any single teacher or instructor to keep up to date with newly emerging technologies and their possible relevance for teaching. This is really the job of any well-run learning technology support unit. So make the effort to attend a once-a-year briefing on new technologies, then follow-up with a further session on any tool that might be of interest. This kind of briefing and training should be provided by the centre or unit that provides learning technology support. If your institution does not have such a unit, or such training, think very carefully about whether to use technology extensively in your teaching – even teachers and instructors with a lot of experience in using technology for teaching need such support. Furthermore, new functions are constantly being added to existing tools. For instance, if you are using Moodle, there are ‘plug-ins’ (such as Mahara) that allow students to create and manage their own e-portfolios or electronic records of their work. The next wave of plug-ins is likely to be learning analytics, which will allow you to analyze the way students are using the LMS and how this relates to their performance, for instance. Thus a session spent learning the various features of your learning management system and how best to use them will be well worthwhile, even if you have been using it for some time, but didn’t have a full training on the system. Particularly important is knowing ow to integrate different technologies, such as online videos within an LMS, so that the technology appears seamless to students. Lastly, don’t get locked into using only your favourite technology, and keeping a closed mind against anything else. It is is a natural tendency to try to protect the use of a technology that has taken a good deal of time and effort to master, especially if it has served you and your students well in the past, and new technology is not necessarily better for teaching than old technology. Nevertheless, game-changers do come along occasionally, and may well have educational benefits that were not previously considered. One tool is unlikely to do everything you need as a teacher; a well-chosen mix of tools is likely to be more effective. Keep an open mind and be prepared to make a shift if necessary. what it should be used for. These are tools built to assist you, so you have to be clear as to what you are trying to achieve with the tools. This is an instructional or pedagogical issue. Thus if you want to find ways to engage students, or to give them practice in developing skills, such as solving quadratic equations, learn what the strengths or weaknesses are of the various technologies for doing this (see Chapter 6 and Chapter 7 for more on this). Podcasts and lecture capture enable lectures to be recorded, stored and downloaded by students. So why bother to learn how to use other online technologies such as an LMS? In Chapter 3, Section 3, evidence-based research on the limitations of lectures was discussed. In brief, students in general don’t learn well online using recordings of ‘transmissive’ classroom lectures. Perhaps of equal importance, you are likely to end up doing more work because you are likely to be inundated with individual e-mails asking for clarification, or have a very high student failure rate, if you do not adapt the lecture to the online learning environment. This is not to say that the occasional recording from you as the instructor would not be valuable. However, it is best to keep it to 10-15 minutes maximum, and it should add something unique to the course, such as being about your own research, or a guest professor being interviewed, or your relating a news item to issues or principles being studied in the course. It may even be better as an audio-only podcast, so students can concentrate on the words and possibly relate them to other learning materials, such as diagrams, graphics or animations on a web site. If you must use lecture capture, think about structuring your in-class lecture so that it can be edited into separate sections of say 10-15 minutes. One way of doing this is pausing at an appropriate point to ask for questions from the classroom students, thus providing a clear ‘editing’ point for the video version. Then provide online work to follow up each of the recorded components, such as a topic for discussion on an online forum, some online student research or further reading on the topic. However, in general, delivery of content is much better done through a learning management system, where it is permanent, organized and structured (see Step 7 later), available in discrete amounts, can be accessed at any time, and can be repeated as often as is needed by the learner. Or it may be even better to get students to find, analyse and organise content for themselves, in which case you may need other tools than an LMS, such as blog software such as WordPress, an e-portfolio or wiki. Again, the decision should be driven by pedagogical thinking, rather than trying to make one tool fit every circumstance. Online learning technologies such as learning management systems have been designed to fit the online learning environment. This requires some adjustment and learning on the part of teachers and instructors whose primary experience is in classroom teaching. Like any tool, the more you know about it the better you are likely to use it. Thus formal training on the technology is necessary but need not be onerous. Usually a total of two hours specific and well organized instruction should be sufficient on how to use any particular tool, such as a learning management or lecture capture system, e-portfolio or synchronous webinar tool, with a one hour review session every year. The harder part will be figuring out how best to use the tools educationally. This requires you to bring a clear conception of how students best learn (Chapter 2 and Appendix 1), what methods you need to match how students learn (Chapter 3 and Chapter 4), and how to design such teaching through the use of learning technologies (Chapter 6, Chapter 7 and Chapter 8). 1. How much formal training have you had on your institutional learning management or lecture capture systems? Is this enough or are you now fully confident that you know all the features and how best to use them? 2. 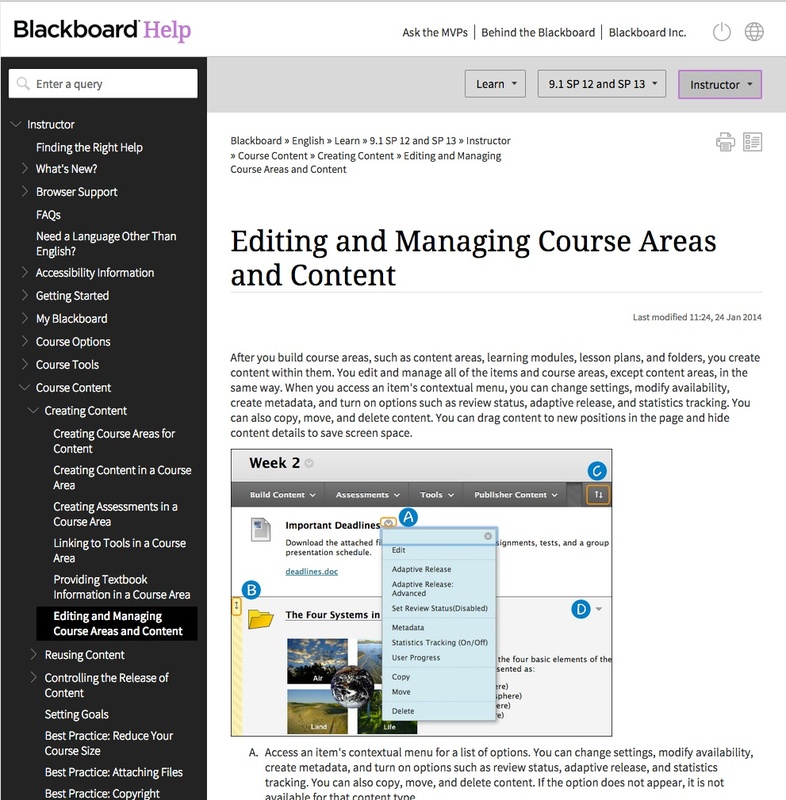 When should you use a synchronous technology such as Blackboard Collaborate? What are the disadvantages of synchronous technologies for online students? (see Chapter 6 for more on this). 3. Should you rethink entirely your teaching when considering blended learning or could you use mainly your classroom material? 4. What would be the possible disadvantages of using recorded lectures online? 11.7 Step five: master the technology by Anthony William (Tony) Bates is licensed under a Creative Commons Attribution-NonCommercial 4.0 International License, except where otherwise noted.